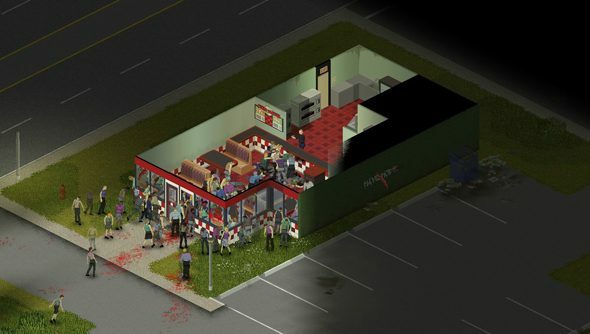 Project Zomboid has been shambling onwards in the public eye for nigh on four years now. Bits of it have fallen off in the process, but the game’s been sustained the whole time by an otherworldly undead force: the sheer strength of its central survival pitch. The Indie Stone are now implementing endgame features like vehicles, stealth and NPCs – and shooting for a finished game in the first few months of 2015. The march begins with a trumpeting of Zomboid features yet to come. Stealth-peeking, fence-creeping and shooting around corners will “shake up the looting game significantly”, and vehicles will render the journey between West Point and Muldraugh both shorter and squishier – provided you have a mechanic and enough siphoned petrol. News on the radio and kids’ shows on the telly will provide crafting tips, as well as a new means of keeping your character from madness. And NPCs will finally be pushed out in a not-too-distant update. Finally, the devs are working to overhaul their UI with the help of an outsourced team who “made a phenomenal UI for another game”. Joypad and split-screen players in particularly are going to be served better in the months leading up to 1.0. Our Fraser recommended we buy into Project Zomboid in early access over a year ago. Perhaps there’s a forgotten three-year-old Paypal transaction with your name on it?